Export your products easily to Google Shopping, Amazon, Nextag, Bing, and many more. 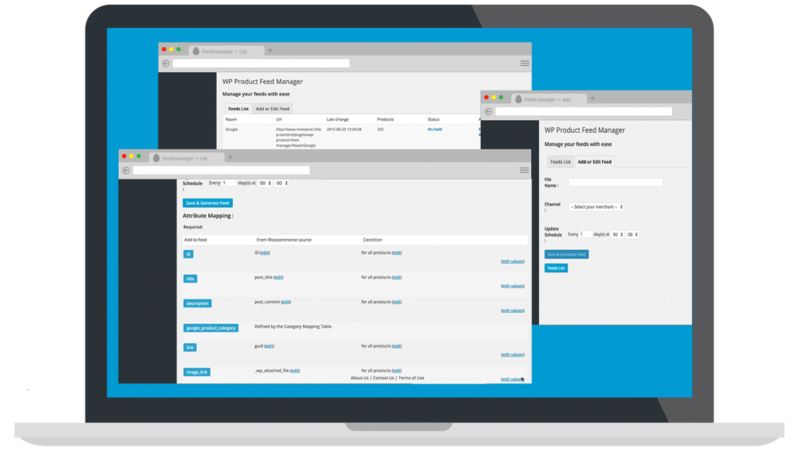 Quickly build and optimize product feeds with our advanced product feed manager. Creating a new feed is as easy as can be. Install the plugin like any other WordPress plugin and with just a few clicks the feed of your targeted Channel is ready to be used and within minutes you’re ready to start trading in hundreds of selling channels and affiliate networks. With our innovative category manager you are able to assign the most appropriate feed specific sub-category without any hassle. This feature alone will often improve your conversion rate significantly. We have done all the work for you and when you create a new channel feed we have all the required fields connected to the Woocommerce database straight away. You wouldn’t even need to edit a thing and your feed would be approved right away. We also show you what fields are recommended by the channel and we have already filled the fields in for you with data from your woocommerce shop if available. The choice is yours, would you like to include the recommended fields without hassle or not? With our extensive and innovative tool you can optimize your product feed data by overriding and customizing all fields like titles, descriptions, variations etc. You can actually changes everything using a wide set of criteria and thus creating more visibility and sales for every feed! Exclude product when they are non-profitable is easy with our plugin. You can optimize profits when your not advertising products with a low margin, out of season or have a low ROI etc. Your will save budget you can spend on more profitable products. Automated product updates across all your shopping and affiliate channels by simply updating the products in your Woocommerce WordPress store just as you are used to. The plugin does the rest making sure your product feeds are up-to-date and the visibility, sales and ROI will increase.